Amsterdam & Den Hague | Sleep Late Tomorrow! As my first week on a client project in Zürich wound down, my colleagues made plans to fly to Paris, Milan, and London for the weekend. As I wondered about the possibilities of a weekend getaway, my screensaver caught my eye. 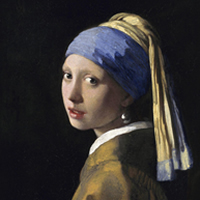 The girl with the pearl earring looked at me enquiringly, and I smiled. In two hours, I was airborne towards the Netherlands. Amsterdam- famously known as the party capital of Western Europe, begs to be removed from that perception. It is a city that is steeped in culture, history, war wounds, art and academic achievements. The wonder that is Amsterdam, starts with the airport- Schiphol international stands 11Ft below sea level, so if you have a fear of the ocean, maybe this is the closest you will ever get to scuba diving on dry land! As I checked into my hotel, I felt a bout of flu coming on. I pored over the train schedules and maps of Amsterdam and prayed to the gods of the runny nose to hold it for a couple of days. The next day, bright and early, armed with Kleenex, I headed out into the cool winter air of Holland. Amsterdam charms you as soon as you set foot into it. Its cobbled streets and quaint red brick houses, give you the feeling of having gone back in time, when a piece of bread, and some conversation, was all you needed to live on. As a professed art lover, my first stop was the Rijksmuseum, home to the Dutch golden age. The ground floor of the Rijksmuseum has scenes depicting the history of Holland, and is quite expansive in its collection, but I just did not have the will or the patience to look around. I had a date with Messrs.Rembrandt and Vermeer, and I intended to keep it! I can tell you with absolute confidence that no amount of studying can prepare you for the experience of coming face to face with the genius of the Dutch Masters. I could wax eloquent on their style, beauty, and a million other things, but the appreciation of art is extremely personal, and the paintings you love, are about the person you are. 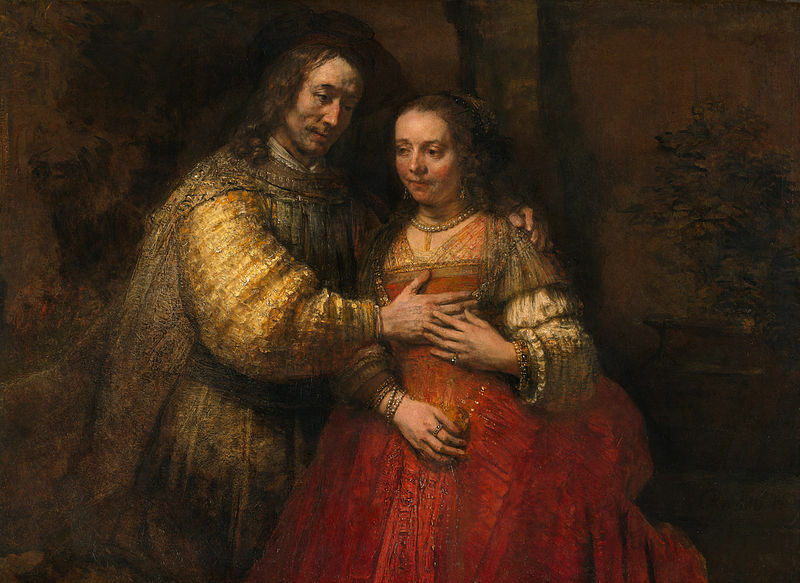 My favorite piece is Rembrandt’s “The Jewish Bride”. Van Gogh once wrote that given a piece of stale bread and a glass of water, he could stare at the painting for a fortnight. The delicate suggestion of intimacy, the perfect study of light and shadow, the mastery in subtle colors and bold strokes, is a sight to behold, and as a science student, I also appreciate Rembrandt’s attempt at understanding the physics of optics! 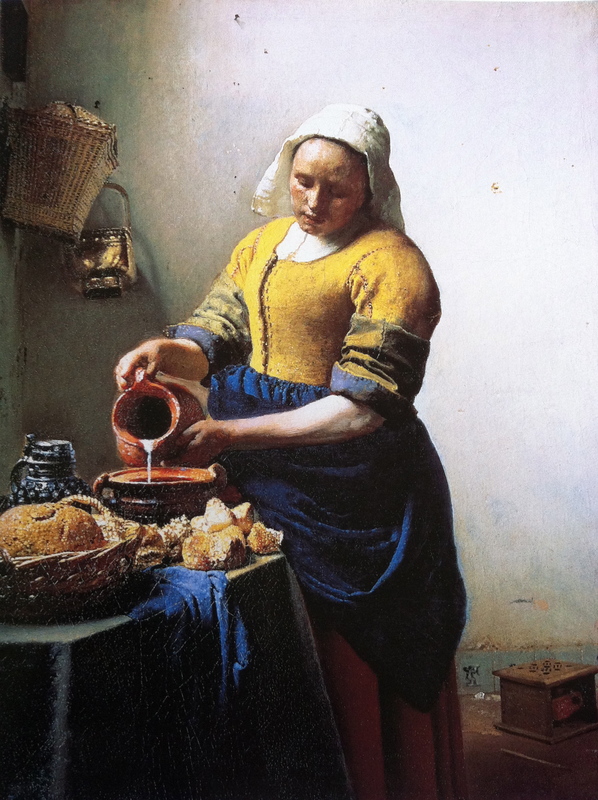 Of the luminous little Vermeers at the Rijksmuseum, the “Milk Maid” is my favorite. Taking an everyday task, and capturing just the solemnity of the moment is the best part of Vermeer’s prodigy. His dexterity and attention to detail, established him as a true poet of simple life, and also, as my personal favorite. He painted only 34 works in his entire lifetime, each of them a marvel. 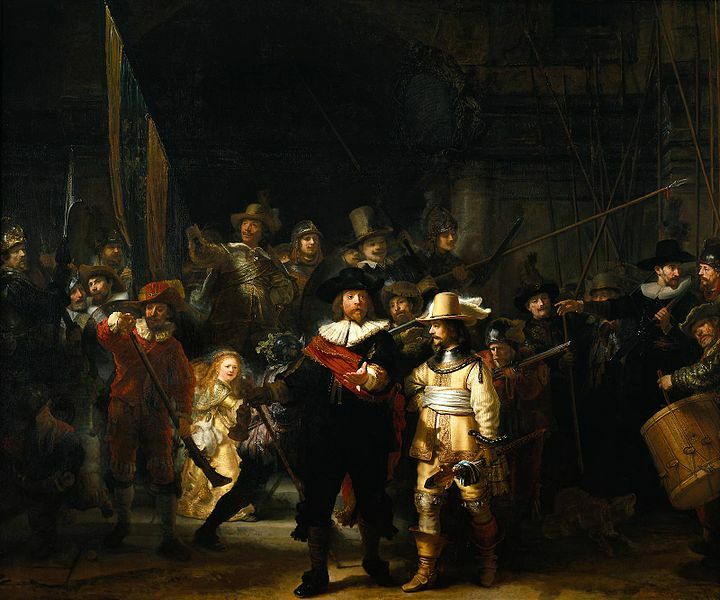 I never understood completely why “The Night Watch” is Rembrandt’s most famous piece. Then again, I had never known the magnitude of detail that could be enmeshed into one painting. The powerful, at the same time, attentive brushstrokes depicting even a fleeting instant as the bullet grazes a man’s hat, is something only Rembrandt could do. Watching the paintings for hours together cannot satiate you, and leaving them behind fills you with a sense of melancholy and abandonment. I now, truly commiserate with Thomas Crown. However, I had another pilgrimage to make, right across on Paulus Potter Straat – The Van Gogh museum. The gallery boasts the most extensive collection of Van Gogh’s works, as well as personal artifacts. It is a rare evolution that we have a chance to witness- from a student of art to the greatest artist of the century. My personal favorites are: “Almond Blossoms” and “Wheat Field with Crows”. I loved them simply because of the stark contrast and the brilliant representations of two extreme sides of a personality. 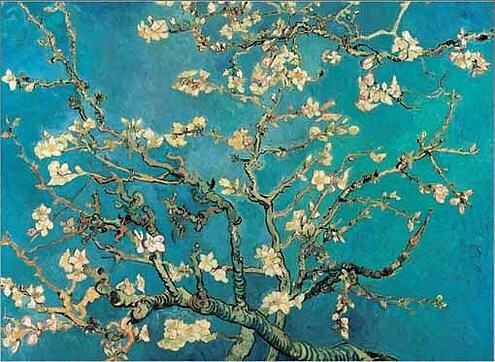 “Almond Blossoms” painted on the occasion of the birth of his nephew, is a hopeful, bright, and innocent piece. “Wheat field with crows” on the other hand, gives one a terrible sense of foreboding. Widely acknowledged to be the last painting he ever made, the gloomy pessimism of the canvas gives an eerie insight into the fact that he would shoot himself within three days of the painting’s completion. I left the museum with a profound empathy towards the genius unrecognized in his time.Today, a single Van Gogh is worth millions of dollars. 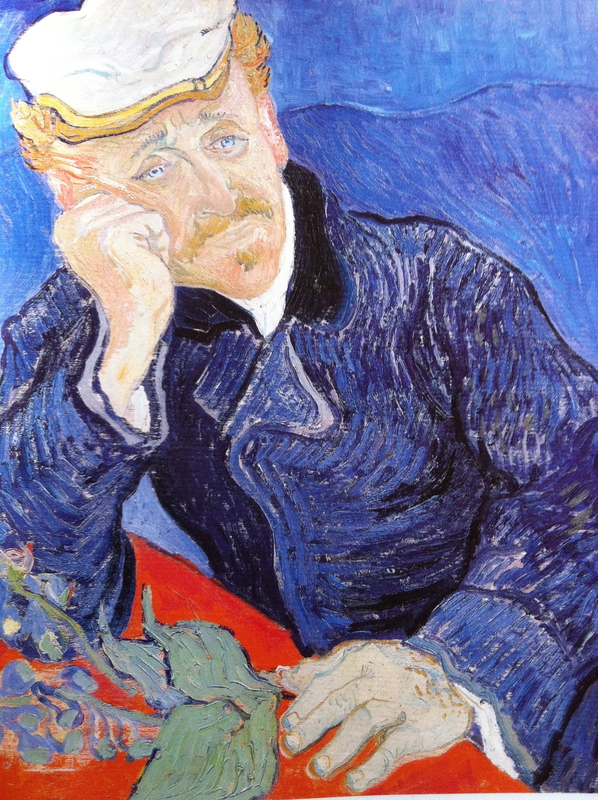 The highest price ever paid for a Van Gogh is for “Portrait of Dr.Gatchet”, which sold for a record 82.5 million USD in 1990- a 100 years after his death. 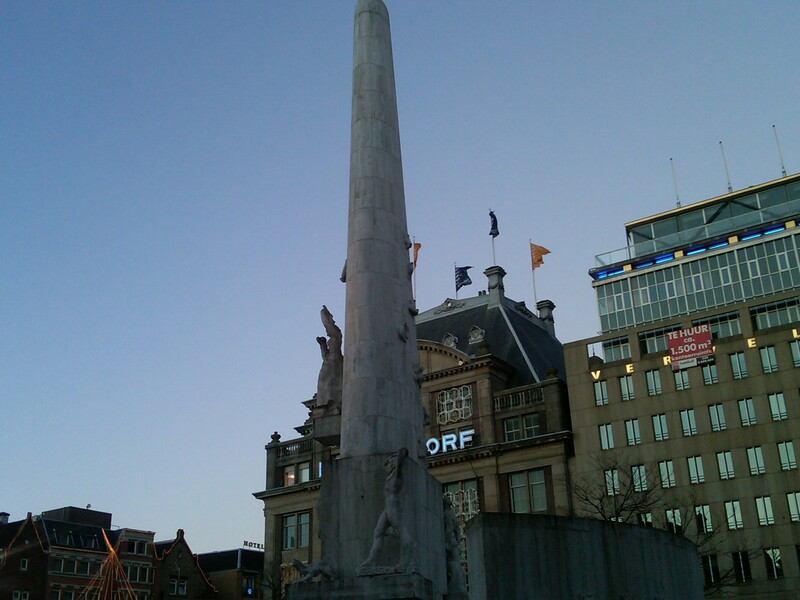 As the day wound down, I visited Dam Square, the city center of Amsterdam. Shops selling hash brownies and Burberry knock offs surround the city center, and its most popular attraction is Kaalvestraat, which is a shopping street akin to 5th Avenue. This is a must see on your visit to this beautiful city, especially if you’re scouting for souvenirs and quaint coffee shops, teeming with tourists looking for Cannabis! The central relief of Dam Square, a 22-foot Freudian nightmare, is probably the only element of the city that I don’t particularly enjoy. It was built as a monument to commemorate those who lost their lives in World War II, but its most significant feature, takes away from its original message with great gusto. However, it does make for an entertaining point of discussion! I will let the sculpture speak for itself. 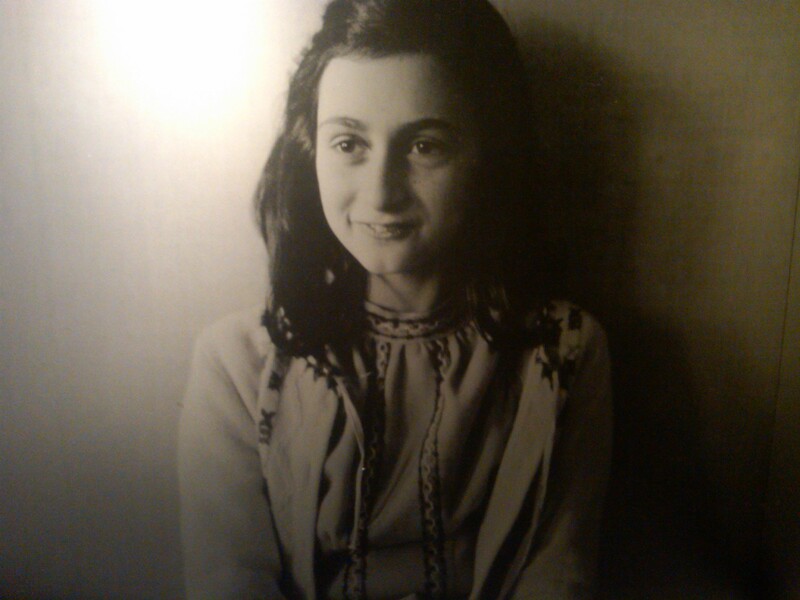 My last visit of the day was to the Anne frank house. As I walked through the halls filled with relics of the Nazi invasion of Europe, I felt the hopefulness of a 12 year old with big dreams for her life. In the midst of hiding and living in fear, she still had the same concerns and problems as any other teenage girl – boys she likes, girls she hates, and dresses she wishes she had. The strength and tragedy of a family, beautifully portrayed, is a piece of history that you will carry forever with you once you visit this shrine. 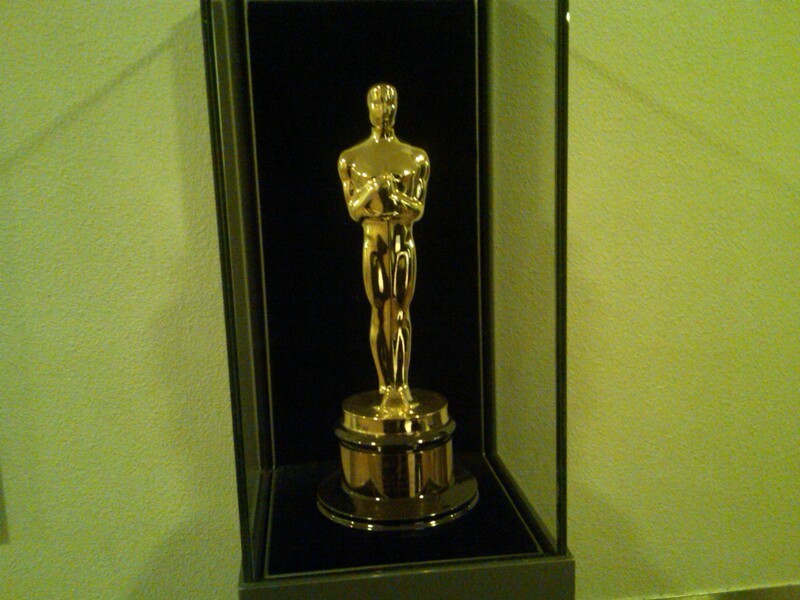 In the midst of penetrating history, you will encounter the Oscar that Shirley Winters won for her role in the 1959 adaptation of “The Anne Frank Diaries” It is a strange polarization between solemn history, and Hollywood glamor, and as karmic circles go, a perfect tribute! My second day in the city of canals began with a train ride to the country’s political capital, and residence of the royal family, “Den Hague”. As the double decker train rumbled on, I felt like a 4 year old screaming in delight at the windmills passing by. Den Hague is also home to the “Mauritshuis”, which is the Royal painting Gallery. The building of the Mauritshuis is very deceptive. Like a diminutive safe box containing marvelous treasures. Numerous self-portraits by Rembrandt, majestic paintings by Paulus potter, Ferdinand Bols, Pieter de Hoochs- but my sight was set on something else. As I finally laid eyes on the “Girl with the Pearl Earring”, I felt a sense of anti climax. It would not be an exaggeration to call it the Dutch Mona Lisa – barely a couple of feet tall, and like the Mona Lisa, her look is like a whisper of suggestion. Each second that you stand there looking at the painting, is punctuated by that fleeting look. This incandescent little Vermeer is a must see for every art lover. 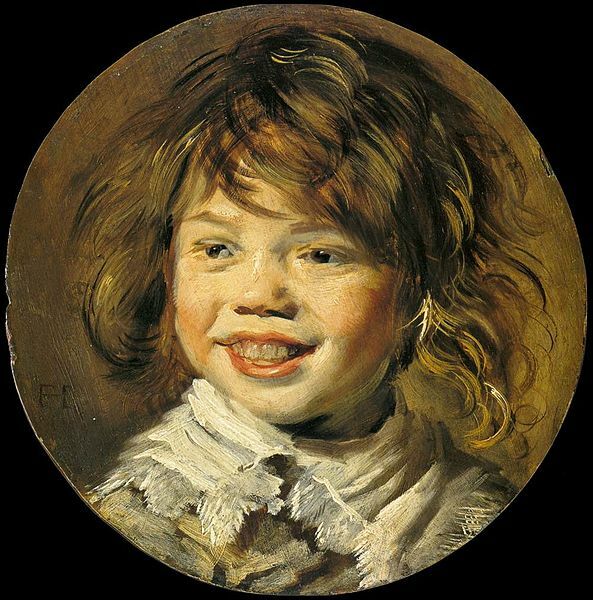 Through the plethora of artwork, I discovered a rare gem tucked away in a corner, which quickly became my personal and unexpected favorite – The painting of a small boy by Frans Hals. No more than 6 inches in radius, this small work, is a pictorial representation of honesty and innocence. My artistic odyssey in Holland, was finally complete. The city provided me with my only rendezvous with Dutch Cuisine. At a little shop selling pastries. I chose a piece of “Banana Ballen”- a sweet pastry, with banana crème and powdered sugar. The Dutch are famous for many things, double entendres included. Food is not one of them! Late in the afternoon, I took the train back to Amsterdam. As we passed Leiden, Rembrandt’s birthplace, I met Tanya. As we struck up a conversation, I discovered that she was a Libyan refugee. She and her family fled from the country during the Libyan Revolution, and sought refuge in four different countries. To this day, Tanya has never been able to get in touch with her family, but she hopes they are safe and happy. Today at 42, she is a medical student, studying to be a general surgeon. This is a shout out to her resilience and inner strength. She requested that if I wrote about my travels, I write about her as well, in hopes that somewhere, her family might just read it and know she was safe. Travel brings with it, an astounding realization- through the Rembrandts, Vermeers and Van Goghs, at the end of the day, you crave for the comfort of your pillow, and knowing that your loved ones are safe. 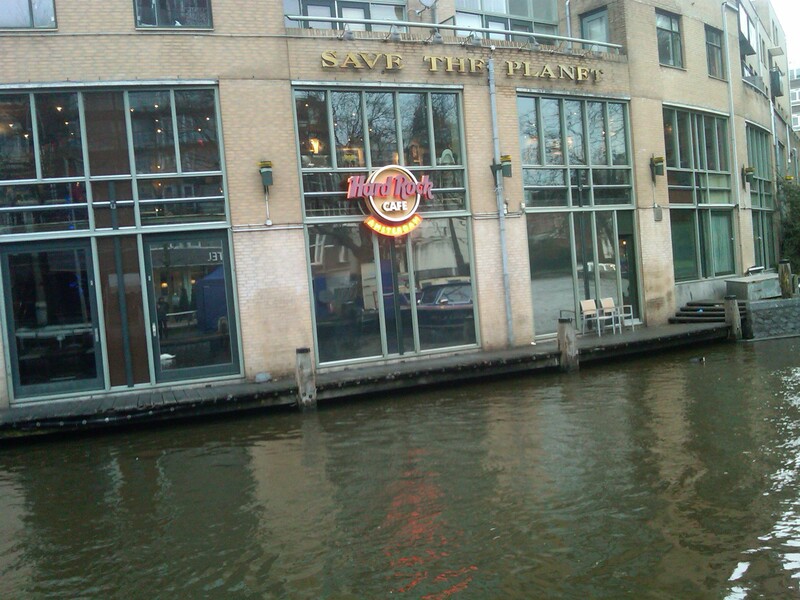 After a quiet meal at the hard rock café, I took a boat ride down Amstel River. 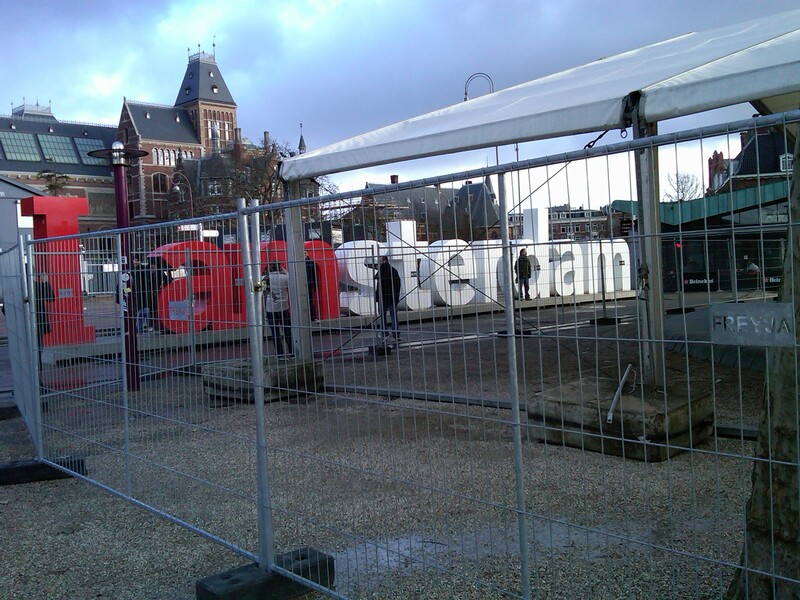 This is one of the more traditional things “To Do” in Amsterdam. My personal style is to explore the place myself rather than take a tour. Hearing someone talk constantly, denies you the opportunity to actually absorb the essence of the place you’re in. So if you’re like me, you will love one of the quainter boat rides, where they give you snippets of information, but leave you enough time to admire the rest after that. Floating through Amsterdam, you will see the Anne frank house, numerous boathouses lining the shores, the local flea market and the Heineken beer factory.One of the interesting things is the science center that looks as if it rises out of the North Sea, and is very appropriately named “NEMO”. I asked to be dropped off at Rembrandt Huis. 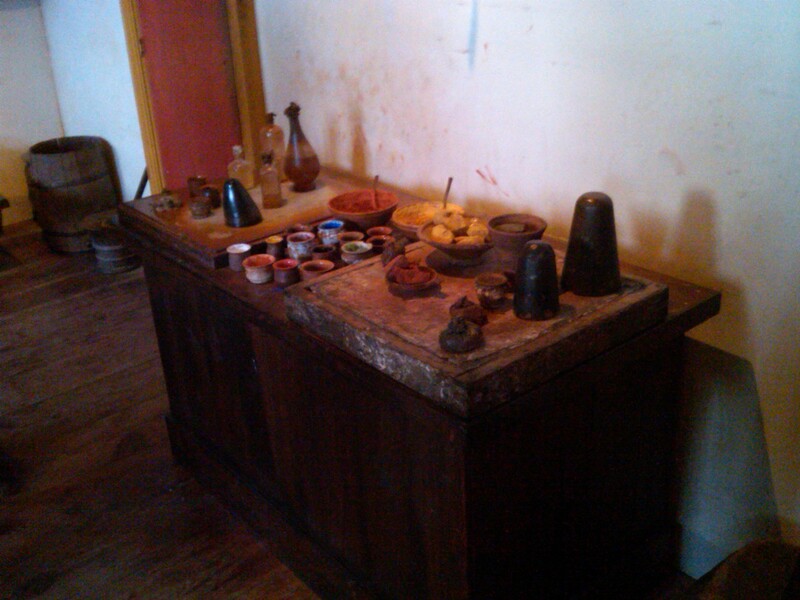 The house in which Rembrandt lived, painted, and spent the last days of his life. I love Europe for this reason. In the midst of great commercialization, you suddenly stumble upon stark reality, profound knowledge and bare boned history. As I wrap up this tour of Amsterdam, my story would not be complete without the mention of Eddie – The cab driver from Ivory Coast, and one of the rare English speaking cabbies in Amsterdam. Eddie was my constant companion, picking me up wherever I requested, and making sure I was safe. That Evening, as Eddie picked me up to take me to the airport, I begged him to drop me off at Amsterdam’s famed red light district first. He firmly refused, and said he would drive me through the area so I could get at a good look as long as I promised not to put my head out the window. So, he drove me through the Babylon of Amsterdam, and upon seeing women, men, and everything in between on display, I couldn’t help but stick my head out! Finally, back at the Schiphol airport, as I hugged Eddie good-bye, and boarded my flight, I looked out the window for a last glimpse of Holland. As I clicked the seat belt shut and reached for my Blackberry to turn it off, all I could feel was extreme gratitude that my father was on speed dial “1”.